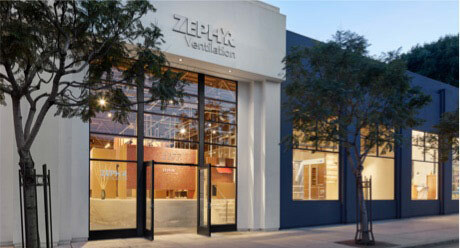 SAN FRANCISCO, March 15th, 2017 — Zephyr, the industry leader in ventilation design, innovation and technology, will exhibit at the 2017 Architectural Digest Design Show from March 16th – 19th, 2017. This year, Zephyr celebrates 20 years of reinventing the ventilation category and challenging the definition of a traditional range hood. Zephyr will showcase its new, industry-first Black Stainless Steel range hoods made with titanium coating, along with hoods from its Arc, Cheng, and Essentials Collection at Booth #191 during the renowned design show. As kitchen design evolves, homeowners and designers are looking for an alternative to standard stainless steel and white appliances that have dominated the industry now for decades. Zephyr’s Anzio, Ravenna, and Savona are now available in the sleek black stainless finish that are made with an aerospace-grade level of protection that ensures each hood will stand up to the harshest cooking conditions. Zephyr will also display its Limited Edition Okeanito in black mirror stainless and Horizon in black glass. All of Zephyr’s striking black hoods are minimal, timeless works of art and are sure to turn heads at the anticipated design show. Zephyr’s Lucé Wall hood now features a red “Rose” LED accent light that compliments its current Cloud White, Deep Blue, and Amber color options. 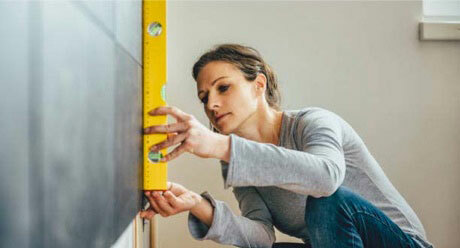 The new color is a glamorous addition to the hood and gives homeowners an added design element. A stunning hood for the most discerning chef, Lucé with ICON Touch™ Controls makes a bold statement in the kitchen with its minimal elegance, smart technology, and competitive price. For designers and homeowners that prefer an out of sight, out of mind approach to kitchen ventilation, Zephyr will display its popular Lux Island, now available in white. An in-ceiling hood that doesn’t obstruct views in the kitchen, Lux Island is equipped with Zephyr’s groundbreaking Perimeter Aspiration System. The ventilation system is designed to remove smoke, steam and cooking odors by pulling air through thin channels located on the perimeter of a stainless steel panel. For the past 20 years, San Francisco-based Zephyr has transformed the kitchen through design, discovery, and care. The company has challenged the perception of what ventilation means in kitchen design and created a new awareness of the importance of a high performing ventilation system. 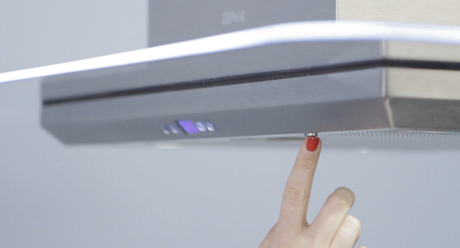 With acclaimed talent such as artistic visionary, Fu-Tung Cheng, and industrial designer, Robert Brunner, Zephyr is able to create cutting-edge residential range hoods unlike any other company. In addition, Zephyr has pioneered ventilation hood technology with the industry’s first DCBL Suppression System®; an exclusive innovation that delivers the most silent, energy efficient and performance-driven range hoods available today. As a direct result of its unexpected design and ever-evolving innovation, Zephyr is the recipient of numerous awards and accolades including, Chicago Athenaeum Good Design, ADEX (Awards for Design Excellence), Appliance Design Excellence In Design, Spark, Architectural Products’ Product Innovation, and Consumers Digest Best Buy Rating. To learn more, visit zephyronline.com.